Blenders are a versatile tool that you want in your kitchen. It has many uses and doesn’t take up a lot space. But how can you know which style and brand has the best blender? In this guide, we’ll go over the many uses for a blender in your kitchen, and then we will rate the top 10 on the market in 2019. You may think that a blender isn’t an essential kitchen item, but that’s not the case. They are very versatile in what can they can do with food, and any tool that is versatile and multi-use, optimizes your time and counter top space. You can add any veggies you want into your blender and it creates soup. The friction of the blender actually heats everything up a bit as well. You can choose from creamy to regular soup depending on how you want it. You can use the blender as a quick way to chop a bunch of vegetables. This will save you time and energy. Blenders help you eat healthier. You can eat a day’s worth of fruits and veggies in one smoothie. You can also add vitamins and minerals. It also lets you incorporate super foods that don’t taste so good on their own. There are ingredients like mushroom powder, maca, cocoa, gogi berries, and blue green algae can be hidden in the sweeter flavors of your smoothie. By having a blender, you can try out new recipes. You can make your own marinade or create a custom dip. You can also use it to make your dessert, salsa, or dressing. You can use it to grind nuts, coffee, and spices to create powders. There’s option of using the blender as a mixer for batters and dough as well. A blender will let you make your own fancy cocktails that you would order in a restaurant. You can look up recipes and create a variety of different drinks. This will give you the chance to try new ones without having to pay the expensive prices. If you or someone you know wants to make their own baby food, a blender is needed. You can make completely organic, healthy food. This is a great way to know what is going into your newborn’s stomach. A good blender can do all the things listed above while taking very little space. The fact is that to do a lot of the things that are mentioned, you would need multiple devices that take up a lot of counter space. If you have a small kitchen, this can be worth the investment. We use a 2-part system when we chose our ratings. We look at what insiders think to get a list together. They test them out and always know some of the best brands. We then looked up each blender from our list on Amazon to see what average customers like you thought of the product. Customer reviews are great because they have no biases. Customers will not hold back from telling people why they did or did not like a product. They also can explain it in a way that anyone can understand. Here is our list of the best blenders on the market in 2018. We tried to find blenders from different brands and at different prices, this way there is something for everyone. 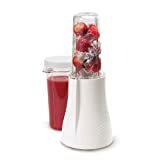 This blender can pulverize the toughest fruits, vegetables, seeds, and superfood for nutritious protein shakes, nut butters, and green smoothies. It has a high torque power base with powerful 900-watt motor. It has patented stainless steel blade design with cyclonic action. It includes the power base, 2 colossal cups, 1 emulsifying blade, 2 flip top lids, 2 handled lip rings, 2 comfort lip rings, pocket nutritionist, hardcover recipe book, and a user manual. It has a 1-year warranty, and it’s easy to clean, you can just wash it with soap and water. This blender has two 16 ounce blending containers, a 200-watt motor, and 2 modes of operation. The motor can take on ice, grains, nuts, and seeds. The blending blades are completely enclosed during operation, making it completely safe. The 2 modes include 1 touch pulse and press and twist continuous modes for blending and grinding to that perfect consistency. It has BPA free containers and lids, which will keep your food safe from harmful chemicals. This blender has smooth rimmed cups without clips or threads for a nicer drinking experience. It also has an overload protection system. It’s designed with 2 powerful serrated central blades that pull ingredients down. The large curved stainless-steel sweeping turn ingredients into small particles. It has BPA free tritan tumblers with handy travel lids. This is an oversized, virtually unbreakable, 64-ounce blender. It has a BPA free container and there is a stainless steel enclosed blade assembly with sealed ball bearings. It has a tamper wand for extreme processing power. It also comes with a 5-year warranty, nut milk bag, BPA free spatula, and easy pour funnel. This blender has a die cast aluminum power coated body. It has 3 programs: smoothie, ice crush, and pulse. It has a 48-ounce tritan BPA free jug. There’s both stainless steel dual blades and a safety lock when removing the blender jar. It also has an overload motor protection. This blender has 14 blending functions and a unique mess-free pour lid. It has 700 watts peak power and a 40-pound thermal shock resistant jar. The jar is also dishwasher safe. It has powerful ice crushing with patented Ice Sabre blades, and a 3-year warranty. This is a great blender for everyday use. It has amazing ice crushing power that turns chunks of ice to crushed ice in just seconds. You can make smoothies, shakes, grind coffee beans, puree fresh vegetables for soup, and shred and grate cheese. It has a classic design and 2 speed controls. The motor can reach up to 1,000 watts. The glass jar is dishwasher safe and shatter proof. This blender has 10 different speeds to blend with. The pulse feature will destroy large chunks of food. The 48-ounce container is perfect for medium batches of food. The aircraft grade stainless steel blades can handle the toughest ingredients. It also self-cleans, with soap and warm water, it will clean itself in 30 or 60 seconds. It comes with the base, 48-ounce container, and mini tamper, and cookbook. 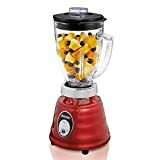 This blender has a sleek design with 1,000 watts of power. It has a 72-ounce jar. Everything about this blender is BPA free. The 6-blade assembly allows you to crush ice faster and blend ingredients smoother than other blenders. Finding the best blender for you is going to take some research. First off, think about what you are going to use it for. Are you more focused on smoothies or are you going to use it for many different types of food? Depending on your answer, you will need a more powerful blender. If you just want to make smoothies, then you can get away with a less powerful one. Also, think about your budget. Blenders have a wide range of prices. The more expensive doesn’t mean that it works the best. Sometimes some of the cheaper blenders can actually work better. More expensive blenders often have more features. As always, make sure to read the reviews. Everything can sound good on paper and not work properly at all. Customers will not hold back if the product is terrible. The best blender is going to be one that suits your needs. As mentioned before, it’s best to think about what you want to use it for. The food you want to blend will affect the kind of blades you want. Make sure to find one is durable and worth what you are going to pay for it. Some blenders can break down quickly. If any of the blenders listed above don’t work for you, don’t be afraid to do your research. Once you find your best blender, you will be able to make smoothies, shakes, dips, and more.